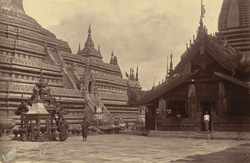 Photograph of the base of the Shwe Zigon Pagoda at Pagan (Bagan) in Burma (Myanmar), taken by Willoughby Wallace Hooper in 1886. The photograph is from a series documenting the Third Anglo-Burmese War (1885-86), published in 1887 as ‘Burmah: a series of one hundred photographs illustrating incidents connected with the British Expeditionary Force to that country, from the embarkation at Madras, 1st Nov, 1885, to the capture of King Theebaw, with many views of Mandalay and surrounding country, native life and industries’. Two editions were issued, one with albumen prints, one with autotypes, along with a set of lantern slides. Hooper made the series while serving as Provost Marshal with the British Expeditionary Force, which entered Mandalay, the Burmese royal capital, on 28 November 1885 and subsequently occupied the city. The war culminated in the annexation of Upper Burma by the British on 1 January 1886 and the exile of King Thibaw (reigned 1878-1885) and Queen Supayalat to India. Capital of the first kingdom of Burma from the 11th to the 14th century, Pagan lies some distance to the south of Mandalay on the Irrawaddy (Ayeyarwady) River. It is one of the most important archaeological sites in South East Asia, with the remains of over 2000 stupas, temples and monasteries scattered over a 30 km radius on a great plain. The Shwe Zigon is the main centre of pilgrimage at Pagan because it is believed to contain significant relics of the Buddha. Its construction is attributed to two kings noted for their patronage of Buddhism: Anawrahta (ruled 1044-1077) is reputed to have begun the building of the pagoda. It became the greatest temple of his reign, during which Theravada Buddhism was established as the Burmese state religion, and it was finished by his son Kyansittha (ruled 1084-1113). The pagoda is important architecturally because its bell-shaped stupa became the prototype for many later Burmese stupas. This view shows its stepped base. A caption by Hooper accompanies the photograph: “This is a very fine building, and is in a good state of preservation. Being surrounded by a high wall, it was impossible to get a picture of the whole of it. It is situated on the north side of the old city, near the present town, and is well worthy of a visit, some of the carving on the monasteries around it being very fine.” Hooper was a dedicated amateur photographer and his photographs of the war in Burma are considered “one of the most accomplished and comprehensive records of a nineteenth century military campaign”. The series is also notable for the political scandal which arose following allegations by a journalist that Hooper had acted sadistically in the process of photographing the execution by firing squad of Burmese rebels. The subsequent court of inquiry concluded that he had behaved in a “callous and indecorous” way and the affair raised issues of the ethical role of the photographer in documenting human suffering and the conduct of the British military during a colonial war.